By Lucy Kirkwood. Sydney Theatre Company. Drama Theatre, Sydney Opera House. April 8 – 18, 2019. Lucy Kirkwood uses Mosquitoes to bridge the gap between science and the general public by creating a piece of theatre that compares the patterns of colliding particles with the chaos of family relationships. Both are hard to predict; both are hard to understand; both are hard to explain. The result is a long dialogue and fact heavy play that melds the two on a stage (designed by Elizabeth Gadsby) that creates the illusion of the massive void and gravitational pull of a black hole – and accentuates the insignificant smallness of humanity. The actors are dwarfed in a light-framed void that is intensified by sparse props and tightly centred direction. Director Jessica Arthur describes Kirkwood as “smashing the conventions of playwriting” by being able to write about “people and relationships in real and relatable detail all whilst interweaving the biggest ideas of the universe”. 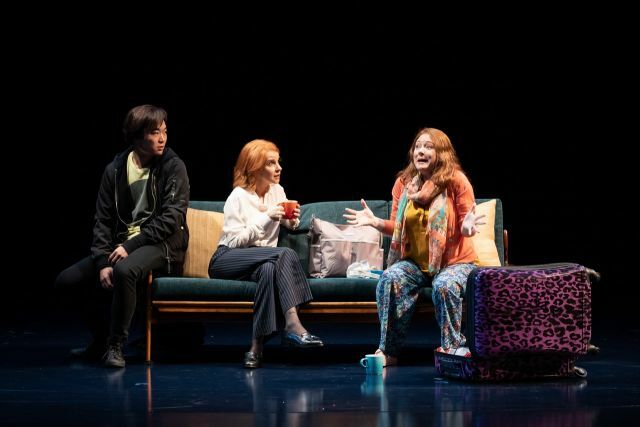 In her production, the characters are sometimes so real that the scenes they enact are confronting, piercingly emphasised by stridently magnified vocals that reverberate hollowly in the vacuum behind them. Jacqueline McKenzie and Mandy McElhinney play sisters Alice and Jenny. Alice is a physicist working in Geneva on the Large Hadron Collider. She is intelligent, committed, logical. Jenny operates on a more instinctive, emotional level, often making decisions based on ‘googled’ misinformation. Their mother, Karen, was also a scientist, but was never acknowledged as she should have been. She has always lauded Alice’s intelligence – and ridiculed what she saw as Jenny’s stupidity. Not a good mix for a family reunion where Alice is concerned about the forthcoming Hadron experiment, Jenny is mourning the loss of her baby daughter, Karen is fearing the creeping effects of dementia, and Alice’s teenage son disappears with something that could shatter everything. This play isn’t easy to watch. The scientific references are challenging, despite the fact that Kirkwood’s message entails the need to demystify scientific ideas. The relationships are also challenging, especially Karen and Alice’s continual denigration and abuse of Jenny. Nevertheless, scenes are neatly directed, drawing characters together, before tearing them apart – the humour that is injected serving to break the tension a little. McKenzie and McElhinney are consummate performers who make their contrasting characters believably strong and convincingly unlikeable. Annie Byron is similarly strong as the unkind but vulnerable Karen. The trio portray a story of familial unpleasantness that is demanding and challenging – for the actors and the audience. Charles Wu wrestles adolescent anger and frustration as Alice’s son Luke, dragged away to Geneva and then ignored by his mother. Nikita Waldron plays his friend Natalie. Their online conversation shows Kirkwood’s ability to move dialogue across generations – and the timing of their delivery aptly mimics the phrasing of electronic chatting. When asked her thoughts on the statement “The information age is the age of anxiety”, Kirkwood says: “The entire play is an expression of this statement … we have access to such a vast wealth of information without having the analytic skills to understand it …” . 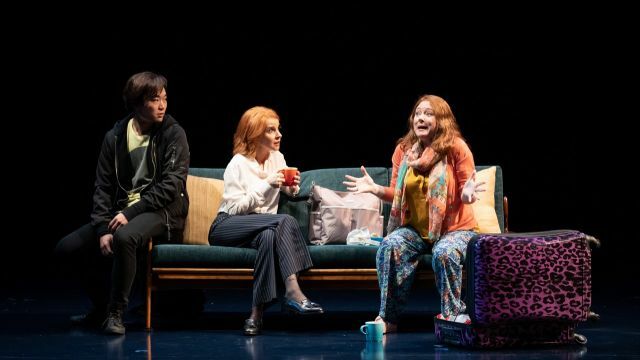 In a similar way, her play exists on both an intellectual and emotional level that will appeal to some – and worry others.